Once upon a time, there was an elegant Turkish bath on Jermyn Street, in London’s St. James’s. 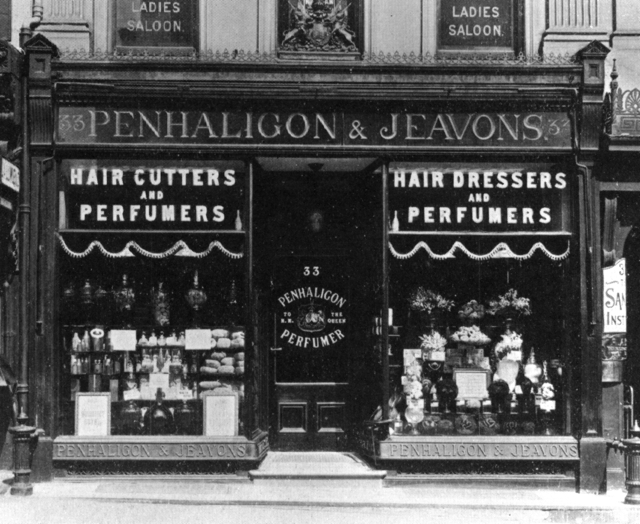 In 1869, a young Cornish-born man named William Henry Penhaligon started work there as a barber. From an early age, Henry had been passionately interested in perfumery and ‘coiffure‘ – and with a keen nose for business, soon opened his own salon just a few doors along spiffy Jermyn Street. It wasn’t long before Penhaligon began creating his own lotions, potions and wonderful scents for his clients – and the perfume house of Penhaligon’s was born. London society was impressed – and even more importantly, so was the Royal Family, who appointed William Penhaligon as Royal Barber and Perfumer to the Royal Court, during Queen Victoria‘s reign. In 1903, Queen Alexandra granted Penhaligon’s its first Royal Warrant. Fast forward to today, and Penhaligon’s still proudly holds two of these prestigious Warrants – from the Duke of Edinburgh (granted in 1956) and The Prince of Wales (1988). There’s probably no more prized recognition of quality and excellence than a Royal Warrant of Appointment – but nowadays, Penhaligon’s is loved and worn by all types of perfume-lovers, not just the rich and royal. Penhaligon’s remains a Great British Success Story: the fragrances are still made and bottled in England, with the same reverence for the highest quality ingredients – though today, these embrace innovative fragrance technologies, such as CO2 extraction and nature-print technology, so that each bottle contains a blend of the traditional, and the new. (The classic bottle, though, still echoes William’s original design: clear glass, with a distinctive ribbon around the sensuous glass stopper. Some Penhaligon’s creations are an elegant nod to the past: Hammam Bouquet (created in 1872) was inspired by the Piccadilly Turkish Bath where William first worked. Blenheim Bouquet – as worn by Winston Churchill – was conceived for the Duke of Marlborough in 1902. It’s fair to say this perfume house has had its downs, as well as its ups, over the years. The Wall Street Crash rippled out to Europe, slowing business for many. But in 1975, with the help of film director Franco Zeffirelli, perfume-loving businesswoman Sheila Pickles bought Penhaligon’s, and began restoring it to its former fragrant glory. And there are seriously exciting things happening right now at Penhaligon’s, which have perfumistas buzzing. 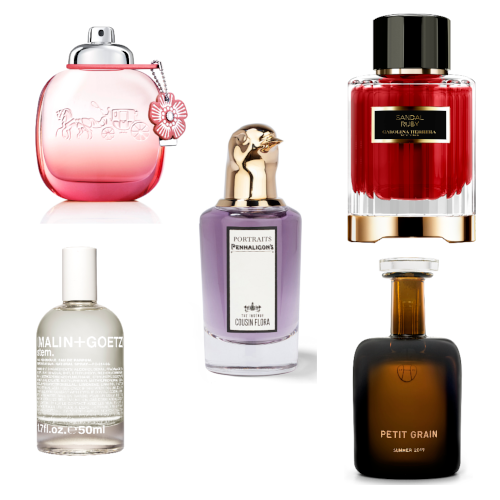 Contemporary inspirations include Iris Prima, created by top nose Alberto Morillas after spending time backstage at the London Ballet, which ‘introduces an intimate, musky leather note to represent the pointe shoe and then light touches of sandalwood, vetiver, vanilla and benzoin, to signify the soul of ancient theatres’. And do make sure to have a sniff of Vaara: a blend of spices, saffron and juicy quince, with a heart that evokes a Maharajah’s summer palace at Balsamand: twin rose notes twining round Indian magnolia, freesia and iris. Unveiled in 2016, the Portraits series of fragrances reimagines eaux de parfum as characters in a Victorian family saga: philandering head of the household Lord George, scheming Lady Blanche, their naïve and romantic daughter Duchess Rose and her eccentric husband Duke Nelson, captured in perfumes as complex as their ‘characters’. From as early as 1907, Penhaligon’s was shipping its perfumes around the globe. Today, thanks to the creativity of a new team at the perfume house’s helm, you’ll find the fragrances in Japan, Ukraine, America, Singapore – and we’ve experienced a little flush of patriotic pride to find a branch in the most glamorous of Dubai’s malls. 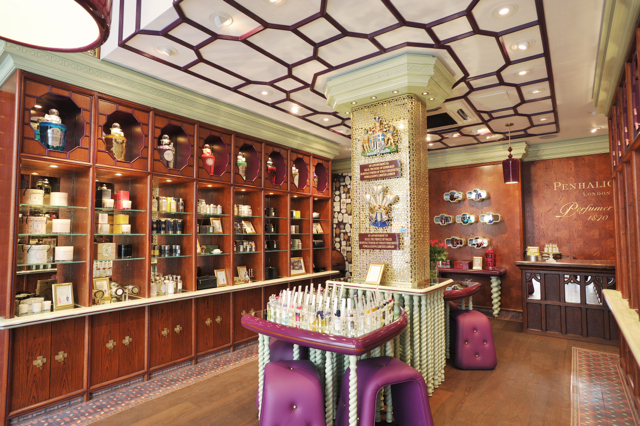 Indeed one of the joys of Penhaligon’s, we’ve always felt, is stepping inside one of their boutiques (see an example, above). Each has its own character – because every shop is a mix of the eccentric, traditional, classic and quirky, filled with antiques, artworks and objets: wonderful places to spend some ‘me-time’, dabbing and spritzing your way through a portfolio of over 35 fragrances. While there, you might well want to take advantage of Penhaligon’s Fragrance Profiling Service, to help you identify your Penhaligon’s fragrance/s from the collection. This first explores your fragrance tastes, memories and associations . 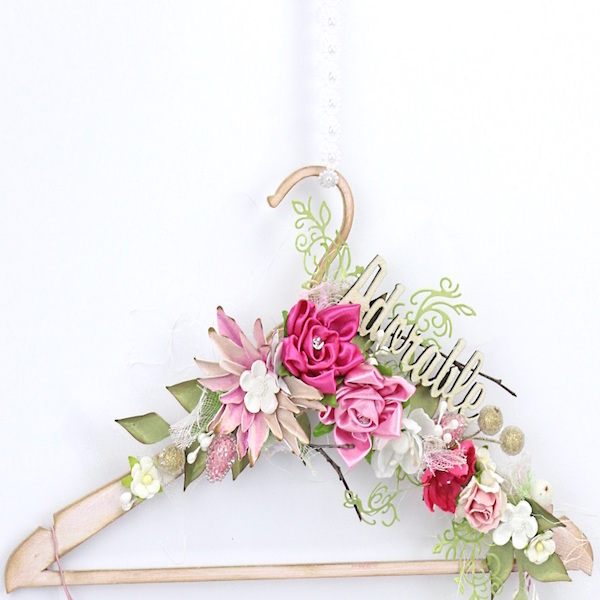 Then you’ll be introduced to each of the fragrance families – floral, Oriental, etc. (without at that stage being told the name of the fragrance, so you’re not influenced by visual clues).